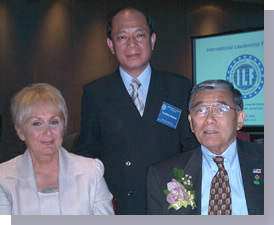 International Leadership Foundation's 2004 Annual Award Gala was held on July 15th in Washington D.C. with the presence of Hon. Norman Mineta, Secretary of Transportation, Hon. Elaine Chao, Secretary of Labor and Dr. John B. Tsu, Chairman Emeritus who is also Chairman of U.S. Foundation for International Economic Policy and many other distinguished guests. The Foundation's mission is to promote the civic awareness, involvement and effectiveness of Asian Pacific Americans and overseas Asians. The Public Affairs Program provides future Asian American leaders with a practical understanding of how the government works. The Foundation collaborates with other entities which share the same wish to achieve the same goal. U.S.Foundation for International Economic Policy supports the goals of International Leadership Foundation. Dr. Teruhisa Moukuno of Japan was named as one of the 2004 Leadership Award Honorees in recognizing the leadership he has been demonstrating for improving care for the elderly by establishing collaborative training programs with John F. Kennedy University and its supporting professional groups in Northern California in order to enhance the quality of young professional persons who are engaged in social and care services for the elderly. The U.S. Foundation has been playing the key role in promoting this collaborative and international exchange programs between Japan and the United States for the furtherance of international cooperation in the field of social and care services for the elderly. We are pleased that Dr. John B. Tsu was awarded a special citation and Dr. Teruhisa Mokuno was named as 2004 Leadership Award Honoree, the first person from Japan.